One of the most exciting advances in modern dentistry is the great success of the dental implant. Implants can be used when natural teeth and roots are lost due to trauma or decay. 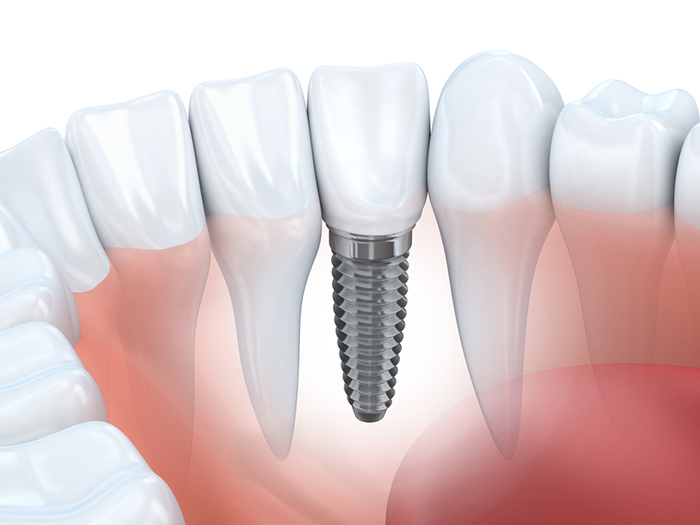 Dental implants can be thought of as artificial roots that are securely anchored in the jaw. They are cylindrical devices made of medical grade titanium which are placed in the site of a missing tooth or teeth where they biologically bond with the bone and are capped with a ceramic crown that matches existing teeth. The key to success in implant work is the planning and work up before any work starts. A through oral examination and x-rays including 3-d scans of the implant placement site are done to determine the best implant system and site for placement. more time is spent planning so that the actual procedure is quick and effortless. When placing implants a hole is made in the bone where your tooth was removed or a gap exists and the implant is inserted. The implant has grooves, channels, or holes like swiss cheese. These deliberate design features allow your bone to grow through, in and around the implant, integrating it into your jaw. Quite literally, you grow into it! This piece of the implant acts as a bolt for the second phase of the implant placement. Once this lower bolt part is securely integrated into the bone, the top part is permanently screwed onto the implant. That completes the implant process, and your new “tooth” is now ready for a crown. the appearance and function of a natural tooth. Secure a full or partial implant supported ceramic fixed bridge. In experienced hands, dental implant surgery is now a routine and very successful dental procedure and is considered the best way to effectively replace missing teeth. Dental implants allow patients to regain what they have lost and enjoy improved appearance, function and quality of life. Dental implants provide ‘new teeth’ for people who have lost natural adult teeth. The Dentists at Heritage Dental Group with highly trained support staff deliver the very best in dental implants and crown procedures.